1. 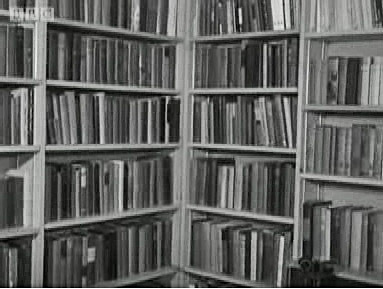 This image of P. G. Wodehouse's bookshelf is just one of the incidental delights to be found in the BBC's literary video archive, In Their Own Words. Other authors showing their remarkable presence in these historical broadcasts include Virginia Woolf, Kingsley Amis, Muriel Spark, William Golding, Robert Graves and E. M. Forster and J. R. R. Tolkien (via drmabuse). 2. Jonathan Franzen's upcoming novel Freedom is getting major, major news coverage, including the cover of Time magazine (he's the first novelist on the cover of Time since Stephen King ten years ago). I haven't read the novel yet, but I liked his previous family saga The Corrections and am looking forward to reviewing Freedom for another web publication as soon as my review copy shows up. In the meantime, here's a piece from The Millions about all the other writers who have been on the cover of Time since the magazine was founded in 1923. 3. Murakami on the Train, a short story by Bud Parr. 4. I like it! A movie called David Amram: The First 80 Years. Don't forget this great video of David at a Litkicks show, too. 5. The Mashed Potato Method of Writing Fiction. 6. Better Book Titles is a funny blog devoted to better book titles. 7. Audio of a Lenny Bruce memorial from 1966 featuring Allen Ginsberg, Peter Orlovsky, the Fugs, Jean Shepard and Paul Krassner. 8. I heard about Jason Hartley's "Advanced Genius Theory" over at Athitakis's place, and wasn't sure what to think. But Hartley's persuasive Largehearted Boy Book Notes playlist puts this one over the top. I'll give the Advanced Genius theory a try. Original Wrapper, indeed. 10. McNally Jackson, one of New York City's better bookstores, is getting an Espresso Book-Printing Machine, which still sounds like a good idea. 11. Enough about print books being dead. They're not. 2 Responses to "Plum's Books"
As always Levi, thanks for these links. I'm glad you linked to the article about all the author's on Time's cover over the years. It's fun to look at and there were some great articles (eg James Joyce after publication of Finnegans Wake). What say folks here about this? at psychological profiling and characterization are getting media attention. My other favorite writer of psychological fiction is Wally Lamb ("I know this much is true" and "She's come undone"). He made it to Oprah, matching Franzen in literary popularity.